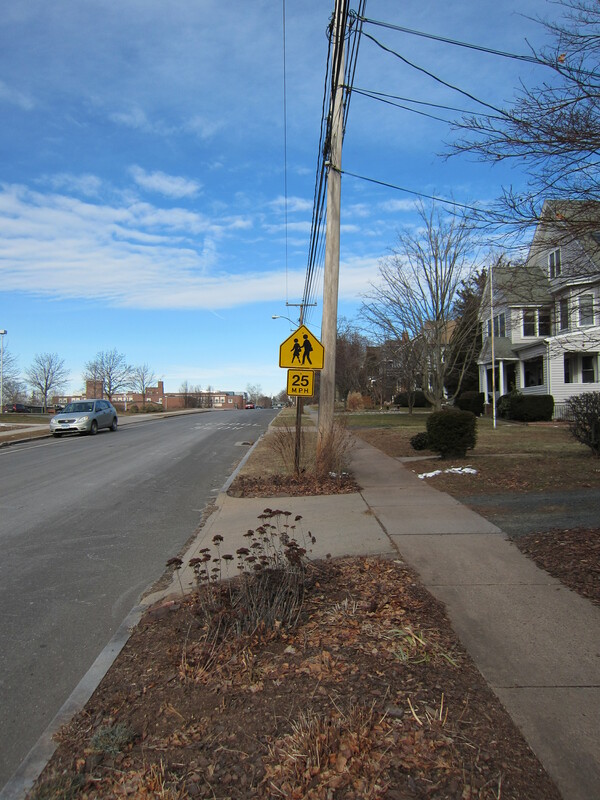 Back in the day, when I was walking uphill both ways to Buttonball Lane Elementary, there was none of this closing-schools-the-night-before nonsense. I remember early dismissals when the snow began burying the playscape (it was wooden, too, not one of these modern plastic contraptions). After an overnight snowfall, we would anxiously await the list of late openings and closings, read by Bob Steele on AM 1080. (I’m currently processing his collection at the Hartford History Center. Yeah, he hated reading those.) We knew it was the real deal when Hilton Kaderli, on WFSB Channel 3, would put on a sweater and tell us we were in for a gollywhomper. Times have changed. Productivity at workplaces around New England has been at a standstill for the past two days, and a single flake has yet to fall. Current Buttonball scholars have turned off their alarm clocks. Radio is about the last place anyone turns to for school (and every other organization you can think of) closings. You don’t need to; they are as close as your smartphone. Hilton has retired to Oklahoma. Channel 3 always had names for the storms, and now The Weather Channel is in on the action as well (I believe the networks are having a field day over this sort of storm during sweeps month). Regardless of whether you are Team Charlotte (Channel 3) or Team Nemo (TWC), it does appear snow is on the way. Here at Cycling Archivist Enterprises, we will admit to a trip to the grocery store this morning. We were low on baking soda. Additionally, we have decided to document the storm. 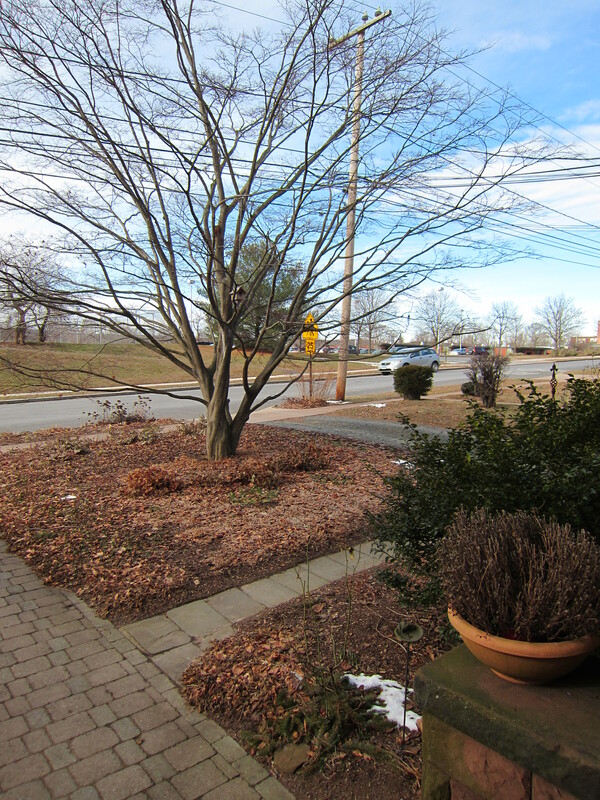 Below are our “before” photos, taken at Headquarters at approximately 12:30pm Thursday. Hopefully we will be able to take photos at regular intervals on Friday. We will see what sort of web Charlotte weaves, or whether we truly find Nemo during the Blizzard of 2013. Starting off with a fairly clean slate. Some snow remains in more shaded areas. 10:00am: Imagine conditions are only treacherous if you are wearing stilettos and walking on leaves. 6:00pm Looks like the street lights will keep me in business till bedtime. 8:00pm Definitely deeper, but still looking about the same. 10:00pm The most significant change yet! 1:00pm Saturday The sun has come out again. 11:00am Starting to stick on the street! Noon. We’re still parked on the street because we live in WeHa and don’t believe parking bans apply to us. 2:00pm You can see that the plow went through for the first time about half an hour earlier. 9:00pm It was pretty blustery. Couldn’t find my footprints from 8:00. Hard to tell the plow went by at 8:30. 7:00am Saturday. It has been so long since they plowed, there’s a foot in the road. 1:00pm Saturday Still waiting for the street to be plowed. 3:30pm Update: Things are indeed turning white. When taking a walk earlier this afternoon (to the-building-formerly-known-as-Bazillions) for some cycling themed provisions, the sidewalks were covered but completely passable. The slushy streets were more slippery. We are slightly disappointed that the bulk of the snow will arrive overnight (we don’t wake up for photography), but are enjoying this project nonetheless. 9:30pm Update: I admit, it’s getting harder to go out there each hour! 10:30pm Update: So much snow came down in the last hour! 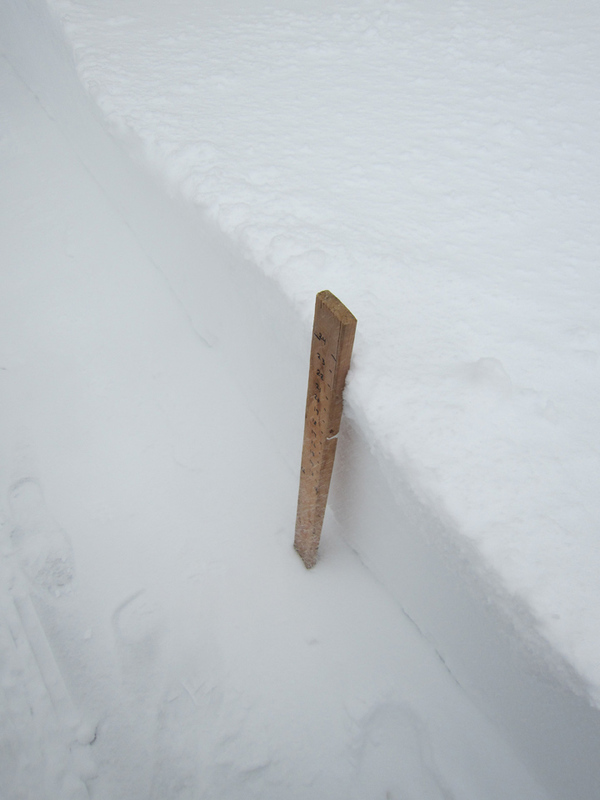 Using the Official Cycling Archivist Measuring Tools, it appears we are at about 11 inches, with some higher drifts. I wanted to photograph the Measuring Tools in action, but I had had my fun with the wind. 11:30pm Update: Got a photo of the often imitated, never duplicated Official Cycling Archivist Measuring Stick. 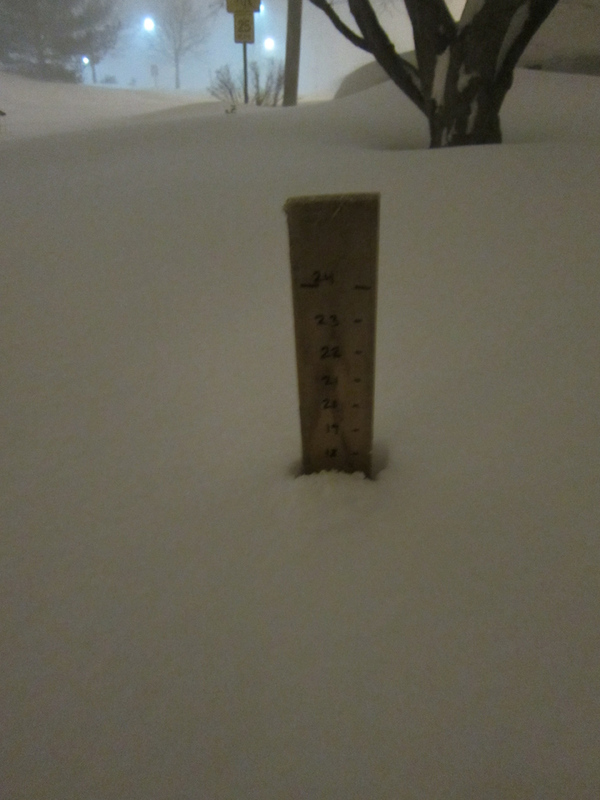 In the front yard of our World Headquarters, totals range from 14 to 18 inches. 2:00pm Saturday Update: The wind gusts are still pretty strong, but the return of the sunshine seems a good spot to end this series. The total accumulation appears to be about 24 inches here. Not too shabby. The road still hasn’t been plowed, but we will be patient. Many thanks to those who have told me they enjoyed this! Measuring after the path has been cleared.